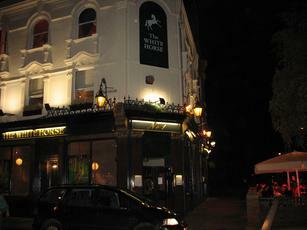 Yesterday was my first visit to the White Horse in several years. It''s always a decent first stop after a football match at Stamford Bridge. The prices don''t seem quite as high as they did last time I visited. The ale selection is ok. Although the darkest beer was a brown ale. The choice was Tiny Rebel Mojito Sour, Harviestoun Summer Legend, Harvey''s Sussex Best Bitter, St. Austell Proper Job, Harbour India Brown Ale, Madness Absolutely, West Berkshire Good Old Boy & Oakham JHB. They no longer stock a real cider. The interior drinking environment is still pleasant. But most people were sat or stood outside enjoying the summer sun and views of the Green. Smells emanating from the barbecue were tempting. Pleasant pub with an excellent range of ales at reasonable prices. Only drawback as referred to before is the loud braying clientele but they are quite easy to ignore if you wish. A great range of ales including Oakham Scarlet Macaw and JHB and some good local ones. Rumour has it that they employ a professional cellar man and it shows. Service was also good and they also, interestingly, have Pilsner Urquell tank beer on tap. The issue is the clientele which is well heeled in the extreme and all the baggage that comes with that - rugby, jobs as brokers etc. - still if you get over your prejudice, those we sere sat next to were perfectly pleasant. I was impressed that though the pub was very busy they served me quickly. Good range of ales (I had Dark Star Pale) and, whilst mine was being fetched by one bar tender, no fewer than three others asked if I was being served. I also ordered a fish & chips that came very quickly despite the crowd. An expensive pub (£4.50 for a pint, £14 for fish & chips) but very well run.